Osteoporosis is a common disease associated with high fracture risk, morbidity, mortality, and huge financial impact. Bone mineral density (BMD) is a major determinant of bone strength which is commonly quantified by dual-energy X-ray absorptiometry (DXA). DXA measurements are used to diagnose osteoporosis, monitor serial changes in BMD, estimate fracture risk, and guide the physicians for therapeutic intervention. Other applications of DXA include vertebral fracture assessment, body composition analysis, and trabecular bone score determination. DXA is not only a very sensitive tool but also has inherent uncertainty, and major sources of variability are patient factors, the technologist, and the DXA scanner. Reproducibility of BMD measurement (precision) is the ability of the same densitometer and technologist to obtain the same result when measuring a patient multiple times over a short period. According to International Society for Clinical Densitometry (ISCD) precision is assessed for each technologist who measures thirty patients twice or 15 patients 3 times, with repositioning between scans. Precision error is subsequently calculated as the root mean square standard deviation (SD) precision error rates are estimated at <1% for the anterior-posterior spine and 1% to 2% for hip. The least significant change (LSC) with 95% confidence interval is the precision error ×2.77 which can be estimated using online calculators. A significant BMD change after the initiation of treatment must escape the precision error of the testing device or exceed the LSC. Quantitative comparison of serial DXA studies is not possible if the facility has not performed the precision assessment. Some DXA manufacturers do also provide site-specific LSC, and it is not an uncommon practice that some facilities do use these LSCs to interpret the serial scans regarding the response evaluation. Obviously, the odds of incorrect interpretations and subsequent impact on the management of patients would be exorbitant. The aim of this study was to find the impact of scan interpretation upon interval BMD changes using vendor's specific and institutional LSCs. This was a prospective study conducted at nuclear medicine section of Department of Radiology Aga Khan University Hospital, Karachi, Pakistan, from April–June 2017. The study was duly approved by Ethical Review Committee of Institute. We have Discovery-A, Hologic, USA scanner and as per vendor's QC protocol, a spine phantom study has to be acquired at the start of the day. When QC of scanner is passed only than clinical imaging can be performed. As the first part of the study, we estimated the precision error of two female technologists. As per ISCD recommendations, each technologist performed DXA imaging (hip, spine, and distal forearm) of 15 individuals three times by repositioning them between each acquisition. Patients were getting off the device after the first measurement and underwent subsequent measurements after getting on the device again during BMD measurement to accurately assess measurement error. Informed consents were taken from all participants. Precision error and LSC (g/cm2 or %) were calculated for each technologist using online calculator at ISCD website. As per ISCD guidelines, if the calculated values were deviated from the acceptable ranges below, the measurement should be performed again after retraining. Femur neck: 2.5% (LSC = 6.9%). To see the impact of LSCs (manufacturer's and technologist), we collected data of patients who had serial DXA scan during the study period. We ensured that when possible same technologist should acquire the follow-up, DXA study to minimize variability in acquired data. All DXA studies were interpreted by two qualified and credentialed nuclear physicians having more than 10 year experience. We use ISCD reporting criteria for DXA imaging, and serial changes were interpreted as improvement or deterioration when found equal or higher than manufacturer's specific and institutional LSCs. Data were compared to find the impact of both LSCs upon interpretation such as deterioration or improvement in serial BMD values. Data were analyzed using commercially available packages the Medcalc® statistical software version 11.3.10 and Statistical Package for Social Sciences (SPSS version 17®). Comparisons between patient groups were performed using Student's t-test for continuous variables (null hypothesis that a sample mean is equal to a given mean with unknown SD or certified value) and Chi-square test for categorical variables. Continuous variables were described by mean ± SD. For all P < 0.05 was selected as statistically significant. Both technologists (A and B) performed DXA imaging of 15 patients three times by repositioning them between each study (getting off and on the scanner). The mean age and female: male of patients cohort imaged by technologist A was 42 years (range: 24–80) and 9:6, respectively [Table 1]. The mean age and female: male of patients cohort imaged by technologist B was 55 years (range: 47–72) and 14:01, respectively. The age and gender ratio between two technologists were statistically significant. No significant difference was found for body mass index (BMI in kg/m2) of both technologists. Precision errors of technologist A for hip, L1-4 spine, and distal forearm were 0.011 (1.1%), 0.012 (1.2%), and 0.016 (1.6%), respectively. Technologist B had precision errors for hip, L1-4 spine, and distal forearm as 0.023 (2.3%), 0.021 (2.1%), and 0.009 (0.9%), respectively. LSCs (precision error ×2.77) of technologist A for hip, L1-4 spine, and distal forearm were 3%, 3.4%, and 4.3%, respectively. Technologist B had LSCs for hip, L1-4 spine, and distal forearm as 6.3%, 5.8%, and 2.5%. 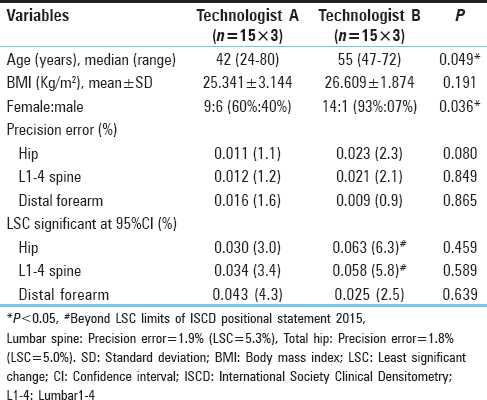 Since precision error and LSCs over hip and L1-4 spine of technologist B were significantly greater than ISCD criteria, she was sent for retraining, and LSCs of technologist A were used for subsequent part of the study [Table 1]. Vendor's LSCs in g/cm2 (%) displayed on DXA images for hip, L1-4 spine, and distal forearm were 0.027 (2.7%), 0.022 (2.2%), and 0.023 (2.3%), respectively. A total of 102 patients who had a follow-up DXA were included in the study. Mean age, male:female ratio, and mean BMI were 63 years, 94%:06%, and 29.274 kg/m2, respectively [Table 2]. Female participants had a mean menopausal age of 47 years. Mean duration of follow-up between two DXA studies was 3 years. Mean change ± SD in BMD between two DXA studies (with range) over hip, L1-4 spine, and forearm were − 0.015 ± 0.046 (−0.16–0.11), −0.004 ± 0.048 (−0.121–0.139), and − 0.005 ± 0.016 (−0.096–−0.024), respectively [Table 2]. BMD changes over hip were found significant in 55% and 53% cases against vendor's and institute's LSCs, respectively, with a nonsignificant discordance in 2% cases (nonsignificant P value). 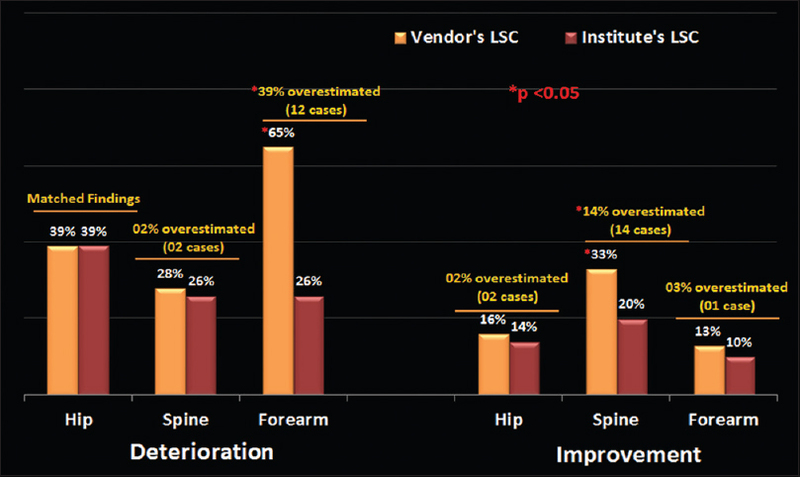 BMD changes over L1-4 spine was found significant in 62% and 46% cases against vendor's and institute's LSCs, respectively, with a significant discordance in 16% cases (P < 0.05). BMD changes over distal forearm were found significant in 77% and 35% cases against vendor's and institute's LSCs, respectively, with a significant discordance in 41% cases (P < 0.05) [Table 3]. Interpretations based on vendor's LSCs revealed significantly overestimated deterioration of forearm BMD and improvement of L1-4 spine BMD values. Rest of the sites showed a nonsignificant overestimation of deterioration or improvement [Figure 1]. Worldwide DXA measurements are the most commonly used to diagnose osteoporosis, estimate fracture risk, and monitor changes in BMD over time. DXA measurements are one of the most precise quantitative measurements in use in clinical medicine today. However, all quantitative tests in medicine have inherent uncertainty, and with DXA measurement, the primary sources of variability are patient factors, the technologist, and the instrument. Accuracy is the difference between the true and measured BMD to the true value of the quantity measured expressed in percent. The accuracy error of DXA better than 10% is sufficient for the diagnosis of osteoporosis and clinical assessment of fracture risk according to the World Health Organization criteria. Precision or reproducibility of the BMD measurement is the ability of the same densitometer and technologist to obtain the same result when measuring a patient multiple times over a short period. When a follow-up BMD measurement differs by the LSC or more, the clinician can conclude that a real loss or gain in BMD has occurred. High-quality DXA testing is necessary for correct diagnostic classification and optimal fracture risk assessment and is essential for BMD monitoring. ISCDs position paper published in 2015 re-emphasized upon quality standards for BMD testing at DXA facilities worldwide to provide guidance for DXA supervisors, technologists, interpreters, and clinicians. However, noncompliance of these quality standards by DXA facilities in Pakistan is not uncommon at least as per our observation. Various DXA facilities use vendor's provided LSCs for interpretation of serial scans which is strongly discouraged by ISCD and other societies. In this study, we first measured the precision error of our two technologists. As the first step, we chose a number of degree of freedom (df) which is defined as the number of measurements which independently contribute to the mean square SD of the replicate scans. As per ISCD recommendation, we selected a 30 df, and each technologist was asked to do imaging of 15 individuals three times by repositioning between each acquisitions. Precision error and LSC of technologist A were well within ISCD criteria, but significant deviation was found for technologist B. Worth to mention that both technologists had performed more than 100 patients prior for the estimation of precision error, but technologist B was sent for retraining as per ISCD recommendation. The patients acquired by technologist B were significantly older with more female predominance compared to technologist A. There are published facts that BMD errors were associated with older subjects and other age-related factors than younger people., However, there are also studies revealing that age is an independent factor for BMD errors. Due to these divided and conflicting published facts, we send technologist B for retraining as per ISCD recommendations. Serial DXA studies are important for the assessment of disease progress and for evaluation of response to treatment for osteoporosis. If measured changes in BMD are equal or greater than facility LSCs, one is reasonably confident that true bone loss or gain has occurred in the patient and appropriate therapeutic decisions can be made. However, as mentioned above in Pakistan, many facilities use vendor's LSCs for interpretation of serial scans and poses a threat of misleading information to treat physicians about the disease progression or deterioration. In this study, using vendor's LSCs, “significant change in BMDs” was found over spine L1-4 and distal forearm which was grossly overestimated as per institute's LSCs. This important finding again sensitizes the importance of using facility LSCs. The interpretation over hip using two LSCs was nonsignificant with lower discordance as well. The plausible explanation could be the optimal positioning with foot fixator used by vendors and technologist as per ISCD guidelines. The clinical impact of nonsignificant two LSCs over hip is low as spine is considered as the important site for evaluation of BMD change due to high proportion of trabecular bone which undergoes more rapid turnover than cortical bone. The degree of discordance was much higher over distal forearm than spine L1-4, and plausible explanation could be laterality (either left or right distal forearm measurement) and greater variation in positioning as compared to spine. Furthermore, there is no cutoff value of precision error and LSC for distal forearm in ISCD guidelines. Since many studies have shown a significant impact of distal forearm measurement upon final diagnosis,, we expect ISCD would consider mentioning cutoff for precision error and LSC for distal forearm as well. This study has limitations such as single-centre experience with relatively smaller sample size and female predominance. Due to the smaller sample size, we could not assess the impact of extreme of ages and obesity (BMI ≥30 kg/m2) over precision error and LSC in BMD measurement. As there is no published LSC cutoff for distal forearm by ISCD, we considered technologist B's distal forearm LSC also within acceptable limits as measured LSCs over total hip and spine L1-4. We conclude that vendor's provided LSC for interpretation of serial DXA is misleading and has a significant negative impact upon patients' management. Every DXA facility must use its own LSC as per ISCD guidelines. Furthermore, ISCD must consider publishing cutoff values for precision error and LSC for distal forearm measurement. US Department of Health and Human Services. Bone Health and Osteoporosis: A Report of the Surgeon General. Rockville, MD: US Department of Health and Human Services, Office of the Surgeon General; 2004. Bouxsein ML, Seeman E. Quantifying the material and structural determinants of bone strength. Best Pract Res Clin Rheumatol 2009;23:741-53. Kanis JA. Assessment of fracture risk and its application to screening for postmenopausal osteoporosis: Synopsis of a WHO report. WHO Study Group. Osteoporos Int 1994;4:368-81. Bennett HS, Dienstfrey A, Hudson LT, Oreskovic T, Fuerst T, Shepherd J, et al. Standards and measurements for assessing bone health-workshop report co-sponsored by the international society for clinical densitometry (ISCD) and the national institute of standards and technology (NIST). J Clin Densitom 2006;9:399-405. Baim S, Wilson CR, Lewiecki EM, Luckey MM, Downs RW Jr., Lentle BC, et al. Precision assessment and radiation safety for dual-energy X-ray absorptiometry: Position paper of the international society for clinical densitometry. J Clin Densitom 2005;8:371-8.
International Society for Clinical Densitometry 2015 ISCD Calculators. Available from: http://www.iscd.org/resources/calculators/. [Last accessed on 2016 Mar 15]. Mazees R, Chestnut CH, McClung M, Genant H. Enhanced precision with dual-energy X-rat absorptiometry. Calcif Tissue Int 1992;51:14-7. Lenchik L, Kiebzak GM, Blunt BA, International Society for Clinical Densitometry Position Development Panel and Scientific Advisory Committee. What is the role of serial bone mineral density measurements in patient management? J Clin Densitom 2002;5 Suppl: S29-38. Lewiecki EM, Binkley N, Morgan SL, Shuhart CR, Camargos BM, Carey JJ, et al. Best practices for dual-energy X-ray absorptiometry measurement and reporting: International society for clinical densitometry guidance. J Clin Densitom 2016;19:127-40. The International Society for Clinical Densitometry. The Precision Calculating Tool. Available from: http://www.iscd.org/. [Last accessed on 2017 Jun 30]. Kanis JA, Melton LJ, Christiansen C, Johnston CC, Khaltaev N. The diagnosis of osteoporosis. J Bone Minr Res 1994;9:1137-41. Ravaud P, Reny JL, Giraudeau B, Porcher R, Dougados M, Roux C. Individual smallest detectable difference in bone mineral density measurements. J Bone Miner Res 1994;14:1449-56. Maggio D, McCloskey EV, Camilli L, Cenci S, Cherubini A, Kanis JA, et al. Short-term reproducibility of proximal femur bone mineral density in the elderly. Calcif Tissue Int 1998;63:296-9. Kelly TL, Slovik DM, Schoenfeld DA, Neer RM. Quantitative digital radiography versus dual photon absorptiometry of the lumbar spine. J Clin Endocrinol Metab 1988;67:839-44. 122 Precision and Monitoring Change in BMD. Available from: https://www.nos.org.uk/media/1732/12_precision_and_monitering_change.pdf. [Last accessed on 2017 Jun 20]. Zaman M, Fatima N, Sajjad Z, Pirwani Z. 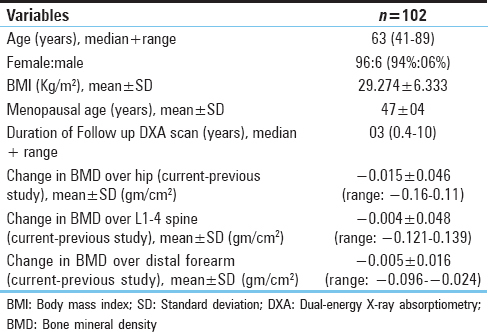 Impact of adding distal forearm DXA to hip and spine measurements on DXA report. J Biomed Graph Comput 2013;3:63-7. Wood K, Dhital S, Chen H, Sippel RS. What is utility of distal forearm DXA in primary hyperthyroidism? Oncologist 2012;17:322-5.